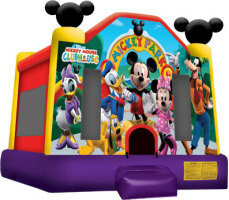 Our Mickey Park kid's bounce house is sure to bring the magic of Disney to your child's party. Mickey, Minnie, Donald, Daisy, and the one and only Goofy invite you to experience their secret clubhouse where all sorts of bouncing fun happens. The hardest part will be having to say goodbye.